Make plenty of these, because they have a way of disappearing! 1. Soak the prawns in water to cover with salt dissolved in water. Soak for 1 hour and pat dry with paper towels. 2. Melt butter,  and brush one sheet of phyllo dough on one side with butter. Fold sheet in half (not lengthwise). Cut the folded sheet into 4 equal strips. as a handle. Lay the finished prawn on a cookie sheet lined with parchment paper. Proceed with the next prawn. 4. 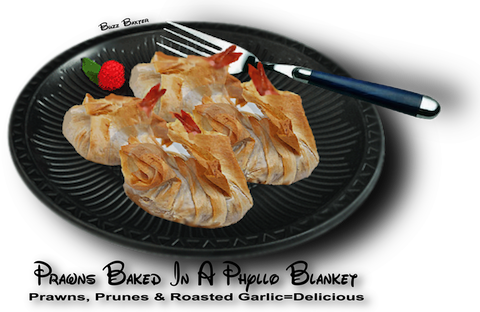 Brush the wrapped prawns with butter and bake in a 350℉ oven until phyllo dough is golden (about 20-30 minutes).